I have projects all over the shop and the mess is driving me nuts. Now that the shop is busy again I need to clean these up or store them away until future time allows me to work on them. So I finally got the car quilt for my son in law done and Mom was so excited. I knew she would be when she saw the finished product. 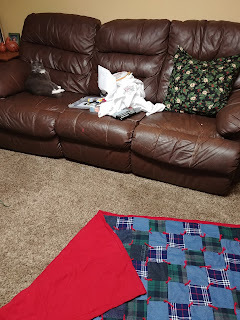 Now she wants to tie the St Patrick quilt so I have to get that ready to go. 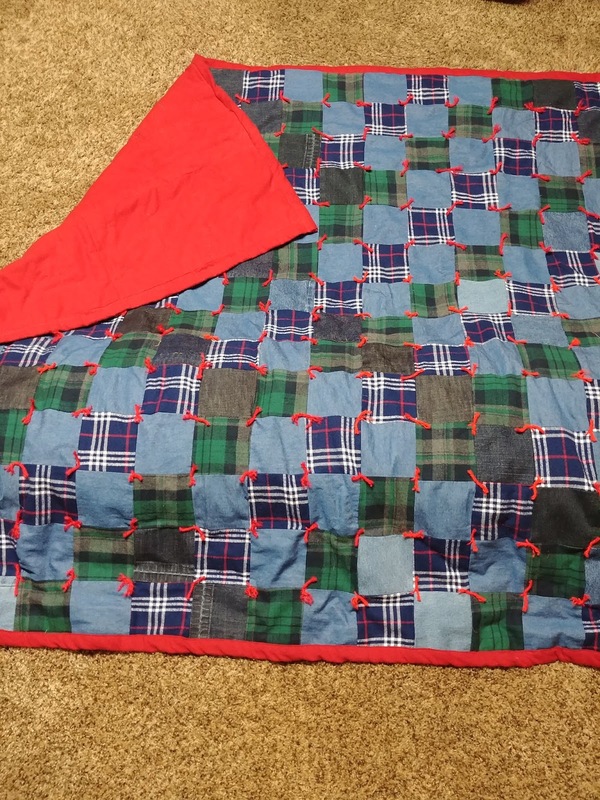 This car quilt was made from all the jeans I cut off for customers. I pick up remnants of heavy flannel when I can find them 75% off. The backing was purchased years ago when we had a fabric store where you could get material for $1.00 a yard. I don't have a very large stash of fabric as I won't allow it, but I am trying to use up what I have. I just hated wasting that wonderful brand new denim. This is my embroider mess along with the cat. Almost every night I stay up a little later than everyone and the cat(s) and I watch TV and embroider together. Because who just sits and watches TV? I was at the doctors office for 3 hours with mom yesterday. What a mess. They are starting a new computer system and no one really knew it well. There was one techie running from office to office trying to correct and help receptionists, Assistants, nurses, doctors. They were so far behind and the tension was horrid. Finally I asked the tech how the file system was set up, I wanted a flow chart to look at. Then I was running around offices pulling people out of their boo boo's. The doctor who FINALLY saw mom asked if I worked for the company. No but I do have a software degree, so I understand operating systems. Computers are still based on ones and zero's. It all goes back to is it on or off? You just have to think like a computer. No I did not need a job. Mom was aghast at my behavior, but I had things to do besides sitting in an office watching people close to tears, losing things, like blood pressure cuffs, and finger monitors. Yes I went and found items for nurses and doctors, I needed to GO! Then I have a stack of old towels, that I am making into a large braided rug for the bathroom, this needs to be finished and out of there. I need the room for more dresses. Oh yes another came in last night Total 9. I though 7 ate 9? Even though the shop is crazy full, I am going to organize and get projects done and out of there, so I can concentrate on what really needs to be done. I can only stand so much chaos and with Sis coming I don't want her to beat me up too bad. I have done what you did at the doc's for other situations. I just jump in and start helping, and after a while, someone asks me how long I have worked there! Sounds like you are getting a handle on the chaos. I don't know Lil sis just showed up and she brings her chaos with her. The quilt turned out great. I agree that it's hard to stand by and watch chaos. Thank you and chaos runs here daily. Long ago at WM, they stayed covered up in the sewing department. Several times, I just started helping people. After that, the workers would see me and ask me to help. When people looked askance, the workers assured them I knew what I was doing. It is not computer work, but it was needed. Funny I used to do the same thing. Your car quilt is beautiful. Good for you for jumping in and rescuing the Dr. office. Time is a valuable commodity and yours has no less value than any other's. Thank you Even Mom likes it! I'm missing something. I thought Lil Sis was there to help-not add to the chaos? Yeah doesn't always work that way.